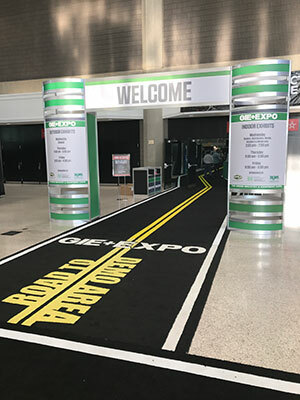 Are you planning to attend the GIE+EXPO Oct. 17-19 in Louisville, Ky.? If so, I have some tips for you. 1. Have a plan. Study the materials. Think through your logistics. Even if you’ve been attending for many years, the show changes every year. Don’t just show up and try to figure it out. 2. Bring lots of business cards. This is a great networking opportunity. Be ready for it. Keep your business cards handy at all times. Keep a few business cards in the back of your name badge holder. 3. Get involved. Find out what opportunities there are to engage with one of the sponsoring associations (National Association of Landscape Professionals, Outdoor Power Equipment Institute, The Professional Grounds Management Society) to help protect and grow our industry. 4. Learn something new. Attend an educational session that opens your eyes, inspires you or provides you with new ideas you can take home and implement in your business. 5. Demo a machine. With more than 20 acres of outdoor demo area, surely you can find something awesome to operate, whether you’re in the market or just for fun. 6. Meet someone new. Even if you don’t have a business card handy, smile and greet those around you, introduce yourself and strike up a conversation. 7. Wear comfy shoes. There is a lot of walking involved with this show. Probably not the best place to break in your new cowboy boots. I’ll be wearing my New Balance running shoes. 8. Bring a backpack. If you don’t mind carrying one, that is. You will collect things all day long and a backpack is the best way to carry it all, including a much needed refillable water bottle. 9. Enjoy yourself. This means different things to different people. Whether it’s riding a mechanical bull at 1:30 a.m. or joining some friends for a 5:00 a.m. run through the city, the options are endless. 10. Make a decision. On your last day, or on your way home, decide what you’re going to do when you get back home. Write down your action items and share them with your team. If you haven’t attended GIE+EXPO before and would like to attend, shoot me an email at Phil@GrowTheBench.com. I may still have a free registration voucher. 1 Comment on "High Performance: 10 tips for attending GIE+EXPO"
If this isn’t a successful event it is truly our fault! Phil, everyone that has been involved in any way with the planning of the 2018 GIE + Expo has gone out of their way to wake us up and to be prepared to shake our business up and be more successful in the future!